1. 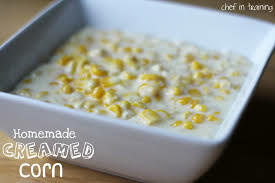 Place the corn cob in the center of a wide vessel in standing position and remove the kernels using a sharp knife. The wide vessel will prevent the kernels from splattering all over the place. 2. Scrape off all the remaining itsy bitsy pieces out of the cob. 3. Melt the butter in a deep saucepan. 4. Add the corn kernels and the scrapes to the butter and saute for 2 minutes. 5. Add the rosemary, sugar, turmeric powder, cornmeal to this and saute for another 2 minutes. 6. Add the milk to the corn and let it cook till the corn get soft. 7. Add the heavy cream and continue to cook. Add more milk or sugar if needed. 8. Switch off when you get a nice creamy payasam(kheer) like consistency. 9. You could fry some cashews and raisins in some ghee and add to the payasam.